Find a driver that maximizes length without sacrificing control. Every golfer wants to hit the ball farther, and the quest for maximum length has led many 21st century golfers to opt for drivers with shafts that are 1 to 3 inches longer than the standard recommended length. However, the longer the shaft the harder it is to control the club and hit the ball squarely. You might hit the occasional drive farther with a longer shaft. But you run the risk of finding yourself chopping the ball out of the rough and fairway bunkers -- if not flirting with out-of-bounds stakes -- on a regular basis. The standard length of a driver for men used to be 43.5 inches with a steel shaft and 44 inches for a graphite shaft. However, in the 21st century a standard driver is considered to be 45 inches. Most male golfers are wielding drivers that measure 45 to 48 inches, the maximum allowed under the United States Golf Association's Rules of Golf. Standard drivers for women are an 1 inch shorter than standard men's drivers. Previously, the standard length for a woman's driver was 43 inches. As of 2012, it's 44 inches. You will see some smaller players on the LPGA Tour using 48-inch drivers that come up to their chin, but the average woman amateur won't be able to control such a club. 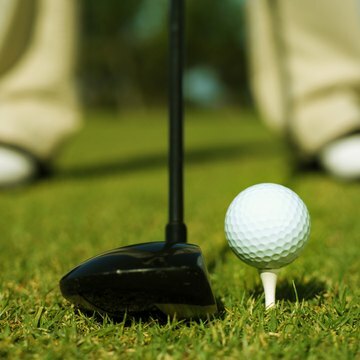 According to LearnAboutGolf.com, if you hit a 43-inch driver on the screws, the ball should travel 250 yards. A 43 1/2-inch driver yields 262 yards and a 44-inch driver 270 yards. Hitting the ball 20 yards farther -- especially if it comes to rest in the fairway -- is a significant advantage, allowing you to hit, for example, a 7-iron instead of a 5-iron to the green. A 44 1/2-inch driver can send the ball 275 yards and a 45-inch driver 275 to 280 yards. As the drivers get longer, there is a diminishing return in increased yardage. In 2006, "Golf Magazine" equipment editor RobSauerhaft tested four drivers with lengths of 44, 45, 46 and 48 inches. While Sauerhaft didn't bomb any drives with the shortest driver, he kept the ball in the fairway more often than with the longer sticks. Conduct your own test on the range or get professionally fitted by an expert. If you have a smooth, rhythmic swing, you might be able to control a driver that's longer than a standard length. But if longer shafts compromise your accuracy, you're driving for show instead of for score. It's also vital to match your swing speed and driver length with the correct shaft. The right shaft flex coupled with the right shaft length will help you achieve the best mix of distance and accuracy.